Pat Whitney beside her "Crown of Thorns." Caroline Losneck reports on Portland's "Crown of Thorns" monument. PORTLAND, Maine — It's estimated that as many as 90 people are sleeping outside on any given night here, despite Portland's commitment to provide shelter to anyone who needs it. Some choose to sleep outside, and for those who do, one woman has built her version of a monument — that's also a place to seek shelter. It's easy to miss, if not for the chirping red plastic motion-activated birds that greet you as you walk by. 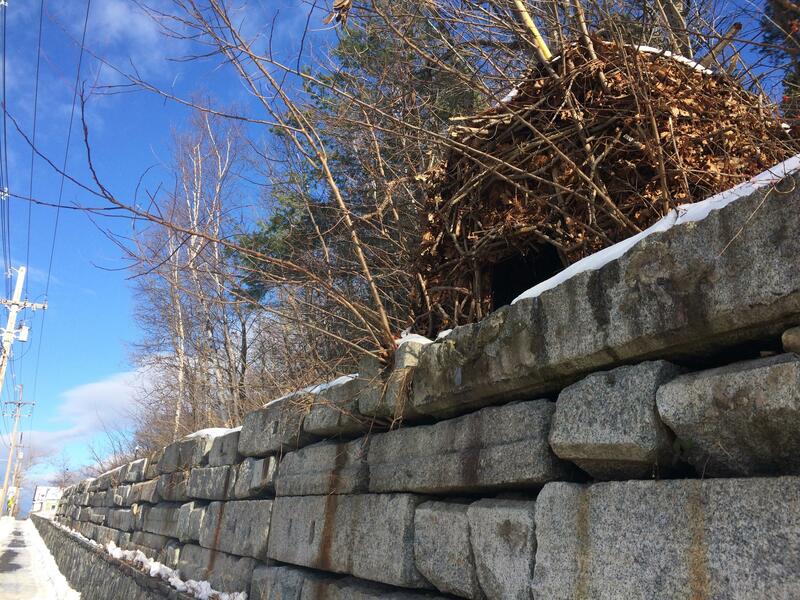 It's about the size of an igloo and sits here on a wooded hillside, just beyond a tall granite wall, in the St. John Valley neighborhood of Portland. 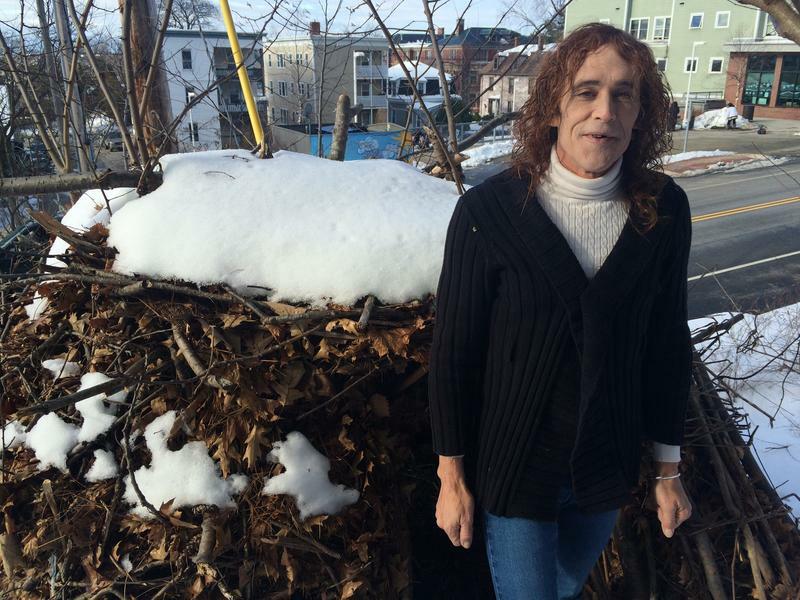 "Looks like a pile of branches weaved together, to some degree, I guess," says Pat Whitney. "Leaves and pine needles. It's got a little opening in the front, an arch over the doorway." Whitney is the creator of this human-size nest that she calls her "Crown of Thorns." She started weaving the branches and leaves together on a whim, and then a structure started taking shape. Whitney added a window and a door. Around Christmastime, she added a nativity scene. "Now we're inside, the two of us. You could get another person in here," she says. "Three people could sit down comfortably. It smells great. Yeah, it smells like a hay barn." At first, Whitney says, people were walking, driving and parking right next to the structure without noticing it. So she decided to add the motion-activated plastic birds in hopes of attracting attention — both to the structure and to the issue to which it speaks. "I hope it helps people. Wake them up a little bit," she says. "I mean, there's big need. Fifteen women didn't get a bed last night. So, you know, there is a need to help these people." Whitney herself was once homeless. She says she slept outside for awhile, but for the last eight months has been living at the Florence House, a women's shelter just across the street. "Crown of Thorns," as seen from the road. Florence House opened five years ago and is home to more than 60 homeless women. It has 25 efficiency apartments, 15 semiprivate safe-haven living spaces for chronically homeless women and 25 emergency shelter beds. "And the really sad part is, is that it's just not enough," says Donna Yellen, chief program officer of Preble Street, which provides 24-hour supportive services such as food programs and social services at Florence House. "That we turn women away every single night, and that they need to then seek other emergency shelter in the city. But, Florence House is known as a place where people can get on their feet, that they can get the support they need." Yellen says it would take an extra 200 beds a month to shelter every woman who comes to Florence House in need. "That's how many people we're turning away every day," she says. "We turn away up to 15 women a night, sometimes, when it's really severe." Whitney's Crown of Thorns project resonates with many of her fellow Florence House residents, who say they have had to sleep under bridges, in bus shelters and in tents — anywhere they can to escape the weather. And as resident Katherine Difiore discovered, the structure is more than just a monument. "She originally built that hut so that when women wouldn't get a bed at night at the Florence House, they wouldn’t have to sleep outside in the elements," she says. "So, she built that so they could be at least, safe." "She has said to me if somebody gets turned away, there is enough room for two people to sleep," says Florence House resident Andrea Nelson. "And I was like, yes there is — and comfortably and warm. And it's beautiful. It's gorgeous." Pat Whitney inside her "Crown of Thorns." Nelson, who says she became homeless a few weeks ago after her significant other passed away, says she's moved by the Crown of Thorns project across the street. "It's gorgeous," she says. "And for me, it was like, every day, looking at that, I look at it. It's just hope — it's a piece of hope for me." 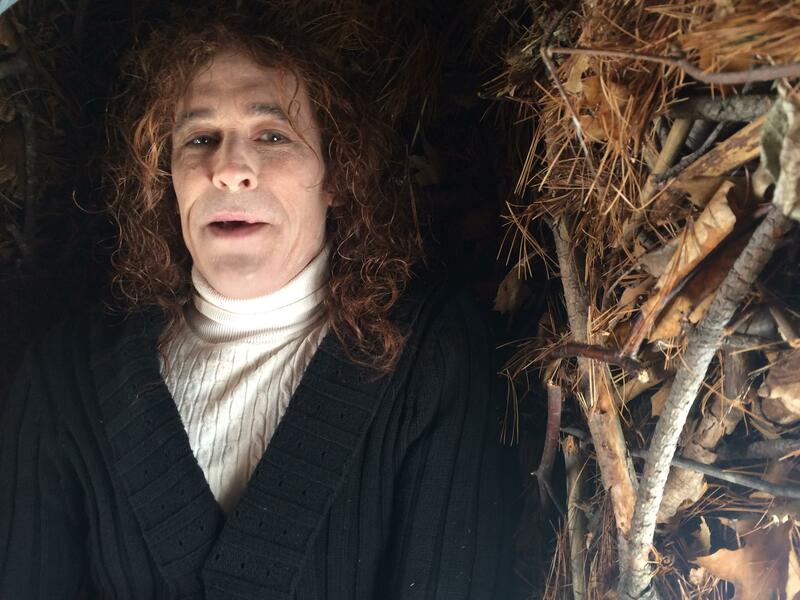 As far as Whitney knows, no one has actually spent the night in her structure yet. And even though she has a warm bed these days, Whitney wants to sleep inside herself, at least once, before her Crown of Thorns decomposes. But she's waiting for a warm, dry night.